What promised to be one of the highlights of the current Brighton Philharmonic season did not disappoint on Sunday when surely all left with a spring in their step. Wheeling out three of classical music’s heavyweights meant there had to be something for everyone but for me it was Mozart’s truly sublime Clarinet Concerto that packed the biggest punch. Michael Collins, one of the foremost clarinettists of his generation, not only took the baton for the prolific Papa Haydn’s Symphony No 102 and Beethoven’s Symphony No 1 but in between gave a majestic performance of what must be one of the world’s best loved pieces for the basset clarinet, longer than the more familiar soprano clarinet with additional keys to enable the playing of several lower notes. Mozart wrote it just two months before his somewhat premature death for his friend Anton Stadler. Despite a few outward shows of minor distraction, regular use of the handkerchief and rubbing of the nose, Collins could hardly have been more attentive as he absorbed himself in the masterpiece and clearly earned the respect and admiration of his fellow musicians. It was a performance that also totally enchanted the audience. 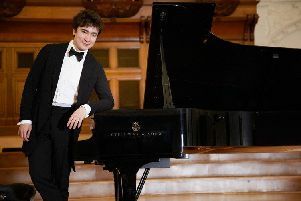 The BPO again go with giants of the classical world with their next concert on Sunday, February 11, when this time acclaimed pianist Howard Shelley performs the dual role of conductor and soloist. He will perform Mendelssohn’s Piano Concerto No 1 in between Schubert’s mighty Unfinished Symphony (No 8) and Dvorak’s Symphony No 6. Another memorable afternoon would seem assured.